Berkeley - To chemist Gabor Somorjai, the entire world is superficial, literally. Everything of importance happens at surfaces. Skaters glide to gold medals on a film of water floating on the ice surface. Friction creates heat at the place where two surfaces meet. Our lungs absorb oxygen at an interface between solid tissue and liquid. In fact "the whole body is a walking solid-liquid interface," he says. Somorjai brought the study of surfaces out of the realm of physics into chemistry to study these interesting and important real-world problems, and in the process revolutionized thinking about the nature of chemical reactions. 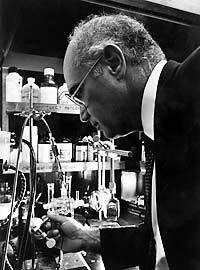 As the recognized father of modern surface chemistry, his discoveries have explained many of the mysteries of surface interactions and led to new and improved methods of using surfaces to make useful products - high-octane gasoline, plastic polymers, and ammonia-based fertilizer. These achievements led this week to his being awarded one of 15 new National Medals of Science, the nation's highest scientific honor given for a lifetime of innovative research. Gabor Somorjai in his laboratory in 1982. "I'm very grateful," said Somorjai, 67, who came to this country at the age of 21 after the Hungarian Revolution in 1956 and enrolled in graduate school at UC Berkeley. "In 45 years, a lot has happened that was very constructive and positive, and I am absolutely delighted and honored that the country appreciated that and rewards me with this medal. "The University of California has been very good to me, too, and I am just very happy that I could give back by creating new science and educating new generations of scientists in the process." Born in Budapest, Somorjai was a fourth-year chemical engineering student at the capital's Technical University when the revolution against the Communist regime began - a revolt that was brutally put down. A member of the defeated militia, Somorjai quickly left Hungary and immigrated to the United States, enrolling in graduate school at UC Berkeley in 1957, along with some 50 other students from Hungary. He received his PhD in 1960 in chemistry and joined the research staff of IBM, in Yorktown Heights, N.Y., where he worked until he returned to UC Berkeley as an assistant professor in 1964. With the advent of new techniques, like low energy electron diffraction, to study surfaces on the atomic scale, surface physics studies took off in the 1950s and '60s, he said. But because these techniques required high vacuum, studies were limited to surfaces - silicon and semiconductors - that were important for their electrical properties. Somorjai was interested in surfaces important for their chemical properties, like platinum, the "father of all catalysts," which for nearly two centuries has been used to catalyze reactions such as the explosive conversion of hydrogen and oxygen to water. "Chemists are much more tolerant of complexity, and I was putting molecules on surfaces - organic molecules of all things - and looking at structures of monolayers, and reconstructions of surfaces that are chemically interesting," he said. "Once we began moving in this direction, we picked up and developed new instrumentation that allowed us to look at surfaces and reactions on a molecular level." One of his major discoveries was that defects on surfaces, like steps and kinks, are where catalytic activity takes place. These defects break and make bonds between atoms, allowing, for example, complex organic chemicals like naphtha to be rearranged into chemicals, such as gasoline. His approach was to work with simple surfaces -single, uniform metal crystals - and discover how chemical reactions occur on them, then extrapolate his findings to more complex surfaces like those used in industrial reactions. His findings help scientists and engineers understand many surface features of broad technical importance, such as adhesion, lubrication, friction, absorption catalysis and other phenomena that depend on surface interactions. Somorjai's successes have shed light on several new areas of science, including nanoscience - the study of materials comprised of mere thousands of atoms - and the biological reactions of enzymes. "What has happened in the last 5-6 years is that surface chemistry is moving into even more complicated materials and to studies of the solid-liquid interface, which means biology," he said. "You can look at biopolymers like your skin, your arteries or heart valves." Over the past 10 years, he and physics professor Ron Shen have developed a technique, sum frequency generation surface vibration spectroscopy, to study surface reactions under real conditions, without the need for placing the surface in a vacuum chamber. "We can look at the surface while it is reacting, and we find that the molecules that are usually easy to detect are stagnant, they don't do any chemistry. So suddenly we can distinguish between the molecules that are transients and come off as products and the molecules that are just spectators." Somorjai has picked up another instrument, the atomic force microscope, to study surface reactions in the nano-realm. He sees many of the same principles that govern reactions at larger surfaces, such as the importance of mobility, the need for chemicals to move around easily on a surface in order for reactions to occur. "All catalysts are nanoparticles - clusters of atoms that do all the chemistry. The question is why? Why doesn't nature use different particles? The reason is that, as you do chemistry, the surface restructures continuously to adapt to the chemistry that occurs, to optimize bonding. And the restructuring is much easier with little clusters, where you have only a few number of nearest neighbors to move, than with a big single crystal, where you have too many neighbors and it's too difficult to weaken bonding. So nature loves clusters to do chemistry." His renown has brought some fun projects his way. Before this winter's Olympic games in Salt Lake City, those responsible for freezing the ice at the skating rink called to ask his opinion about various techniques to make faster ice. He explained, for example, that bubbles in ice make it slushy, because they promote surface melting and thus a thicker water layer. Removing the bubbles, as they do by steaming the ice, keeps the surface water layer thin and the ice faster. "To me, one important aspect is the technological importance of what we did, but the other important part is the conceptual understanding of how surfaces work," he said, noting that there is still much to learn about why ice is slippery and concrete is not. Through his research, Somorjai has educated a generation of leading scientists. Out of the more than 110 PhD students and 150 postdoctoral fellows he has mentored, 60 hold faculty positions, a fact of which he is very proud. "The outstanding graduate students and postdoctoral fellows who come to Berkeley tend to be very creative and do high quality research," he said. Somorjai is the author of more than 850 scientific papers and three textbooks on surface chemistry and heterogeneous catalysis. Among his many awards and honors are the Wolf Foundation Prize in chemistry, and from the American Chemical Society, the Peter Debye Award in Physical Chemistry and the Adamson Award in Surface Chemistry. He was elected to the National Academy of Sciences in 1979, and the American Academy of Arts and Sciences in 1983. In April of this year, he was named a University Professor by the UC Board of Regents, elevating him to the ranks of about two dozen academics attached not solely to one campus, but to the entire 10-campus UC system. He hopes to attend the June 13 ceremonies at the White House with his wife Judith, his son John, his daughter Nicole, and their families.